1. What's involved in getting new dentures? 2. What's the best way to get used to new dentures? As with any new appliance, dentures may feel quite odd, usually they feel big. They may cause increased saliva flow or they may alter speech. One should start by cutting food into small pieces, avoid hot foods, and avoid hard foods until the tissue, where the denture rests, becomes used to the new teeth. As time goes by, one will become accustomed to them. This will take time and you may get some sores initially, don’t panic. 3. My dentures are loose.... what should I do? As the years pass, the tissue and bone may shrink slightly. As this happens your dentures will then loosen. Also, as you lose or gain weight, you may notice that the denture may loosen. Dentures can be relined to help them fit snug again. However, if their bases are too far gone, you may need to get a new denture. If your denture is more than a year or two old and you are using Fixodent everyday… your dentures are too loose and you could benefit from a reline. Relines are usually done same day and should be done every couple of years. 4. Should I use a denture adhesive? Denture adhesive can provide additional retention even for well-fitting dentures, especially for lower dentures. However, denture adhesives are not the solution for old, ill-fitting dentures. A poorly fitting denture, which causes constant irritation over a long period, may contribute to the development of bone loss and sores. These dentures may need a reline or need to be replaced. If your dentures begin to feel loose, or cause pronounced discomfort, consult with your Denturist immediately. Everyone that is missing teeth to varying degree should wear a denture. Complete dentures for those people who are edentulous (i.e.. Have no natural teeth remaining), or a partial denture for those who have some natural teeth remaining. A partial is important to prevent the remaining natural teeth from shifting, which will occur if the spaces are not filled in. Dentures improve chewing and speech, as well as provide facial support which will dramatically improve your appearance and smile. 6. Do I brush them like regular teeth? Dentures should be cleaned, if possible, after each meal. The best way is to remove them and rinse them. If one is able to, brushing the dentures is advised, as well as rinsing the mouth to clean it of any debris. If some natural teeth do remain, brushing them is always suggested. Soak your dentures at night after brushing them, if you wish you can use a denture cleaner like Renew. Do not allow them to dry out because they may warp. It is also much healthier to keep your dentures out overnight to avoid excessive pressure on the soft tissue and bone. Always remember to brush your tongue and lightly brush the gums with a soft toothbrush. Special denture brushes should be used on the dentures. You should not use regular toothpaste on dentures, it is too abrasive. 7. What happens when you get a new denture? The denture process usually takes approximately one week and up to five appointments. New denture wearers need time to get accustomed to their new “teeth” because even the best fitting dentures will feel awkward at first. While most patients can begin to speak normally within a few hours, many patients report discomfort with eating for several weeks. To get accustomed to chewing with a new denture, start with soft, easy-to-chew foods. In addition, denture wearers often notice a slight change in facial appearance, increased salivary flow, or minor speech difficulty. 8. Should dentures be worn at night? Under normal circumstances it is considered best to remove them at night. Research has shown that removing the denture for at least eight hours during either the day or night allows the gum tissue to rest and allows normal stimulation and cleansing by the tongue and saliva. This promotes better long-term health of gums. 9. Do I still need checkups since I don't have any natural teeth? It is important to continue having regular checkups so that your Denturist can examine your oral tissues and your dentures. As you age, your mouth will continue to change as the bone under your denture shrinks or recedes. To maintain a proper fit over time, it is necessary to adjust, reline or remake your denture. Never attempt to adjust a denture yourself and do not use denture adhesives for a prolonged period of time. When in doubt, consult your Denturist. Consider seeing your Denturist once a year for an annual checkup. 1. What is an immediate denture? Immediate dentures are inserted immediately after the removal of the remaining teeth. To make this possible, the Denturist takes measurements and makes the models of the patient’s jaws during a preliminary visit.One of the main advantages of immediate dentures is that the wearer does not have to be without teeth during the healing period. However, bones and gums can shrink over time, especially during the period of healing in the first six to nine months after the removal of teeth. 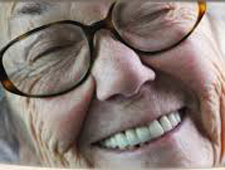 When gums shrink, immediate dentures will require relining to fit properly.One of the main disadvantages of immediate dentures is that you cannot have a try-in… this makes it very difficult to predict how the denture is going to fit and how its going to look once your teeth are extracted and the denture is in place. 2. What is an overdenture? An overdenture is a removable denture that fits over a small number of remaining natural teeth or implants. The natural teeth must be prepared to provide stability and support for the denture. Your Denturist can determine if an overdenture would be suitable for you. 3. What will new dentures feel like? New dentures may feel awkward for a few weeks until you become accustomed to them. The dentures may feel loose while the muscles of your cheek and tongue learn to keep them in place. It is not unusual to experience minor irritation or soreness. You may find that saliva flow temporarily increases. As your mouth becomes accustomed to the dentures, these problems should diminish. One or more follow-up appointments with the Denturist are generally needed after a denture is inserted. If any problem persists, particularly irritation or soreness, be sure to consult your Denturist. 4. Will dentures make me look different? Dentures can be made to closely resemble your natural teeth so that little change in appearance will be noticeable. Dentures may even improve the look of your smile and help fill out the appearance of your face and profile. This is where the try-in is critical so you can see yourself in the mirror before the denture is finished and make sure you like the look of your new dentures. 5. Will I be able to eat with my dentures? Eating will take a little practice. Start with soft foods cut into small pieces. Chew slowly using both sides of your mouth at the same time to prevent the dentures from tipping. As you become accustomed to chewing, add other foods until you return to your normal diet. Continue to chew food using both sides of the mouth at the same time. Be cautious with hot or hard foods and sharp-edged bones or shells. Your upper denture covers your palate so be careful with hot foods and liquids. 6. Will dentures change how I speak? Pronouncing certain words may require practice. Reading out loud and repeating troublesome words will help. If your dentures “click” while you’re talking, speak more slowly. You may find that your dentures occasionally slip when you laugh, cough or smile. Reposition the dentures by gently biting down and swallowing. If a speaking problem persists, consult your Denturist. 7. Can I make minor adjustments or repairs to my dentures? You can seriously damage your dentures and harm your health by trying to adjust or repair your dentures. A denture that is not made to fit properly can cause irritation and sores. See your Denturist if your dentures break, crack, chip, or if one of the teeth becomes loose. A Denturist can often make the necessary adjustments or repairs on the same day. A person who lacks the proper training will not be able to reconstruct the denture. This can cause greater damage to the denture and may cause problems in your mouth. Glue sold over-the-counter often contains harmful chemicals and should not be used on dentures. 8. Will my dentures need to be replaced? Over time, dentures will need to be relined, rebased, or remade due to normal wear, the average lifespan of a denture is about 5 years. It depends on what you eat and your bone structure as they can last longer and they can also wear out faster. If your denture is loose you can get a reline, which involves a new impression under your existing denture, and then the tissue side of your denture is replaced but the teeth are not. This is generally done same day. Dentures may need to be replaced if they become loose and the teeth show signs of significant wear. Dentures become loose because a mouth naturally changes with age. Bone and gum ridges can recede or shrink, causing jaws to align differently. Shrinking ridges can cause dentures to fit less securely. Loose dentures can cause health problems, including sores and infections. A loose denture also makes chewing more difficult and may change your facial features. It’s important to replace worn or poorly-fitting dentures before they cause problems. 9. Must I do anything special to care for my mouth? 1. How do you wear a partial denture? Removable partial dentures usually consist of replacement teeth attached to pink plastic bases, which are connected by metal framework. Partial dentures attach to your natural teeth usually with metal clasps. Otherwise they are not much different than regular dentures. However you should see your dentist regularly to keep an eye on your natural teeth, to clean them and watch them if they become loose. 2. How long will it take to get used to wearing a denture? For the first few weeks, your new partial denture may feel awkward or bulky. However, your mouth will eventually become accustomed to wearing it. Inserting and removing the denture will require some practice. Follow all instructions given by your Denturist. Your denture should fit into place with relative ease. Never force the partial denture into position by biting down. This could bend or break the clasps. 3. How long should I wear the denture? Your Denturist will give you specific instruction about how long the denture should be worn and when it should be removed. Initially, you may be asked to wear your partial denture all the time. Although this may be temporarily uncomfortable, it is the quickest way to identify those denture parts that may need adjustment. If the denture puts too much pressure on a particular area, that spot will become sore. Your Denturist will adjust the denture to fit more comfortably. After making adjustments, your Denturist will probably recommend that you take the denture out of your mouth before going to bed and replace it in the morning. 4. Will it be difficult to eat with a partial denture? 5. Will the denture change how I speak? It can be difficult to speak clearly when you are missing teeth. Consequently, wearing a partial denture may help. If you find it difficult to pronounce certain words with your new denture, practice reading out loud. Repeat the words that give you trouble. With time, you will become accustomed to speaking properly with your denture. Don’t get discouraged off the start if you are not speaking normally, after a week or so you will get used to them. 6. Will my denture need adjusting? Over time, adjusting the denture may be necessary. As you age, your mouth naturally changes, which can affect the fit of the denture. Your bone and gum ridges can recede or shrink, resulting in a loose-fitting denture. Dentures that do not fit properly should be adjusted by your Denturist. Loose dentures can cause various problems, including sores or infections. See your Denturist promptly if your denture becomes loose. 7. Must I do anything special to take care of my mouth? Brushing twice a day and cleaning between your teeth daily help prevent tooth decay and gum disease that can lead to tooth loss. Pay special attention to cleaning teeth that fit under the denture’s metal clasps. Plaque that becomes trapped under the clasps will increase the risk of tooth decay. Your Denturist or dental hygienist can demonstrate how to properly brush and clean between teeth. Selecting a balanced diet for proper nutrition is also important. 1. Are implants worth it? Implant retained dentures are more stable than most other types of dentures. Implants are a proven restorative option with an excellent success rate. Dental implants can be used to replace a single lost tooth or many missing teeth. Many patients who have chosen implant supported teeth report they are happy and comfortable for the first time since the loss of their natural teeth. You still care for your dentures in basically the same way taking them out to clean them and at night, the dentures clip in on the implants to hold them down. The lower denture is more stable and leads to a lot less sores and food getting under it. 2. What are some benefits to implants? Implants for denture wearers have been in use for over 25 years with excellent results. Implants are permanent and with appropriate care will last a lifetime. Pain associated with implant surgery is usually less intense than a tooth extraction. With modern dentistry it should be painless. 1. What is a mouth guard? A mouth guard is a flexible appliance made out of plastic that is worn in athletic and recreational activities to protect teeth from trauma. 2. Why should I wear a mouth guard? To protect your mouth from injuries. The dental profession unanimously supports the use of mouth guards in a variety of sports activities. More than 200,000 injuries to the mouth and jaw occur each year. 3. Do mouth guards prevent Injuries? A mouth guard can prevent serious injuries such as concussions, cerebral hemorrhages, incidents of unconsciousness, jaw fractures and neck injuries by helping to avoid situations where the lower jaw gets jammed into the upper jaw. Mouth guards are effective in moving soft tissue in the oral cavity away from the teeth, preventing laceration and bruising of the lips and cheeks, especially for those who wear orthodontic appliances. 4. In what sports should I wear a mouth guard? Anytime there is a strong chance for contact with other participants or hard surfaces, it is advisable to wear a mouth guard. Players who participate in hockey, basketball, softball, wrestling, soccer, lacrosse, rugby, in-line skating, and martial arts as well as recreational sports such as skateboarding and bicycling should wear mouth guards while competing. Currently, five sports at the amateur level require mouth guards during practice and competition: boxing, football, ice hockey, men’s lacrosse and women’s field hockey. 5. How should I care for a mouth guard? Clean your mouth guard by washing it with soap and warm (not hot) water. Before storing, soak your mouth guard in water, or if you prefer you may add some mouthwash to the water. Keep your mouth guard in a well-ventilated plastic storage box when not in use. Heat is bad for mouth guards, so don’t leave it in direct sunlight or in a closed automobile. Don’t bend your mouth guard when storing. 6. I wear braces. Can I use a mouth guard? A properly fitted mouth protector may be especially important for people who wear braces or have fixed bridge work. A blow to the face could damage the brackets or other fixed orthodontic appliances. A mouth protector also provides a barrier between the braces and your cheek or lips, limiting the risk of soft tissue injuries. You should consult your Orthodontist, Dentist or Denturist before wearing any kind of mouth guard. If you have a retainer or other removable appliance, do not wear it during any contact sports.